A.R. Quinton (1853 – 1934) the well known and highly competent Water-colour artist, whose love of the English countryside is reflected in his paintings, resulted in his works being used to illustrate books such as ‘The Historic Thames’ written by Hilaire Belloc in 1907. 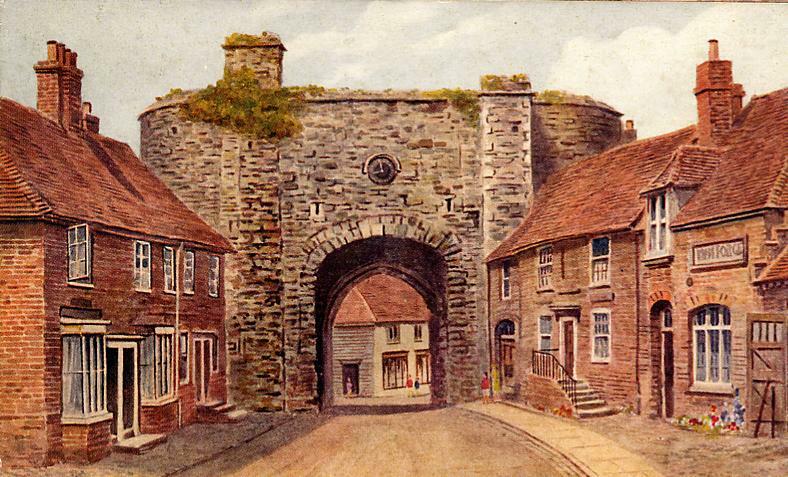 He also painted for postcard publisher Raphael Tuck, but mostly for J. Salmon Limited of Sevenoaks; travelling frequently by bicycle the length and breadth of the country to produce his paintings. There are eight of his water-colours of Rye published as post-cards by Salmon’s, as time went by the facade and other details of some buildings and street scenes changed so the cards were updated. 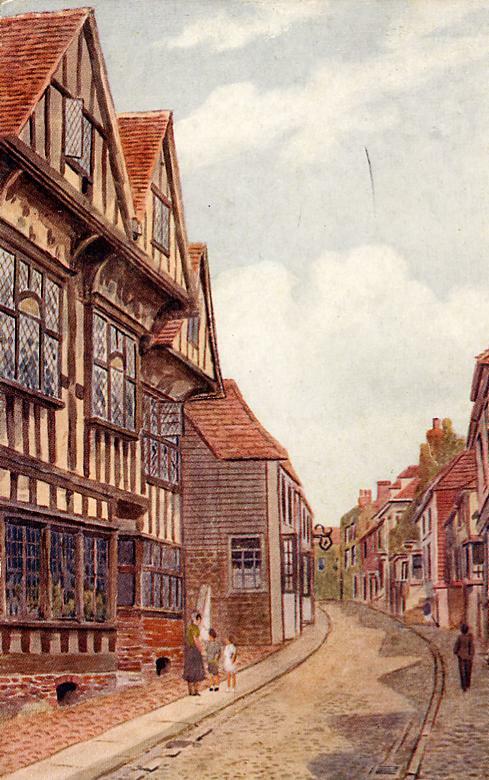 Horses, horse drawn vehicles and people were removed and buildings altered; but I think the original paintings by ARQ capture the true essence of Rye now mostly lost to the motor car age. The original paintings would have been produced around the First World War. 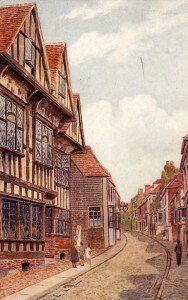 The water colours were worked up in his studio from photographs and sketches made on location. The up dated issues obviously appeared some time later. 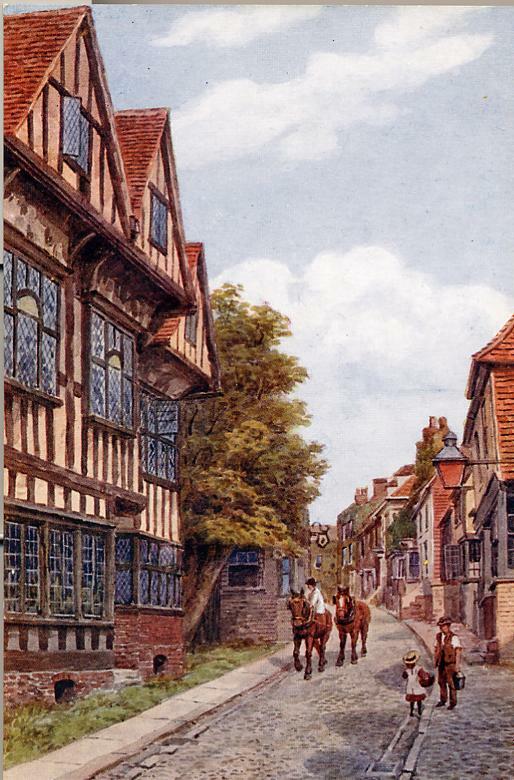 It seems that the Mermaid Inn was a red brick building and then altered to take on a Tudor appearance but on closer inspection it seems possible that the brick wall has been removed to reveal the original Tudor facade. 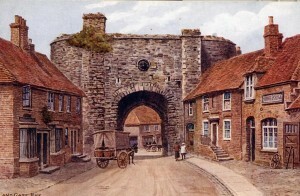 It was common in Georgian and early Victorian times to give Tudor buildings a new appearance by adding a brick wall. When Tudor became the ‘in thing’ again many of these walls were ripped down to reveal the original glory of the building. The postcards were also changed to bring them up to date and possibly new figures and petrol motor cars were not added to give the cards a more ‘timeless’ life. 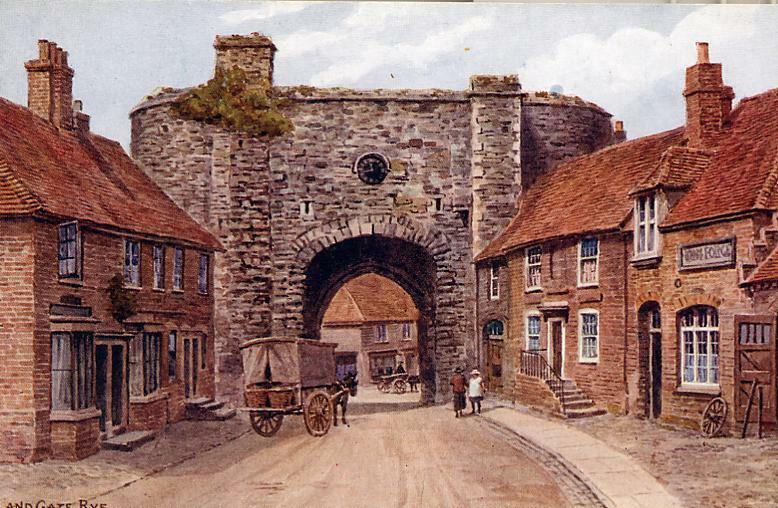 It is reassuring to see that not just the Landgate itself but every building pictured have scarcely been changed to this day. 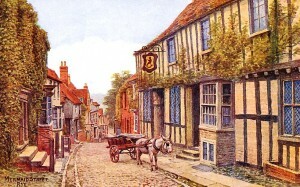 The donkey and cart were possibly from Hubbard’s Bakery of Market Street. 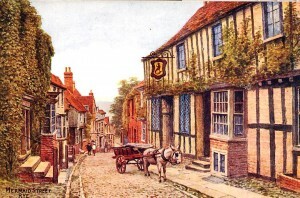 There is a story that around 1903, before most people in Rye had ever seen a motor car, a young man rushed into a crowded barber shop in Cinque Ports Street (in the building now the home of Monrow’s Restaurant) and excitedly shouted that there was a ‘horseless carriage’ outside The Crown. There was a rush to see what they all thought would be a motor car. When they got to the Crown all they found was a donkey and cart. 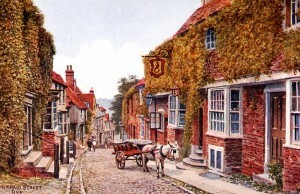 On returning to the barbers they discovered the young man in the chair having his locks trimmed!